Beatons Blog : New Milton Raising Money and Raising the Roof for Children's Author Rob Stevens! New Milton Raising Money and Raising the Roof for Children's Author Rob Stevens! Beatons New Milton announces its first Charity of the Year event in aid of Helping Older People New Forest through celebrating a new children's book by New Milton author, Rob Stevens - 'Lucky Break'. For young and grown up 'children' enjoy exploring your newest tearooms and bookshop in town and meeting British Airways Captain, Rob who picks up a pen the moment he lands. Our doors open at 4 pm for a fun fundraising competition to win Afternoon Tea for 4 (!) plus 2 sets of Cream Teas for 2, too. Add to that a taste of Rob's new book, a one-off performance by Beatons' very own 'mini-choir' of a specially written song. 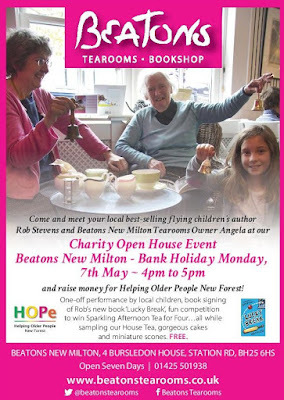 Enjoy free samples of our famously delicious carrot cake, scones and jam served with Beatons New Milton's House Tea and you've got a very special welcome from tearooms owner, Angela and her team to the New Milton community. Look out for our posters appearing around town over the next fortnight!